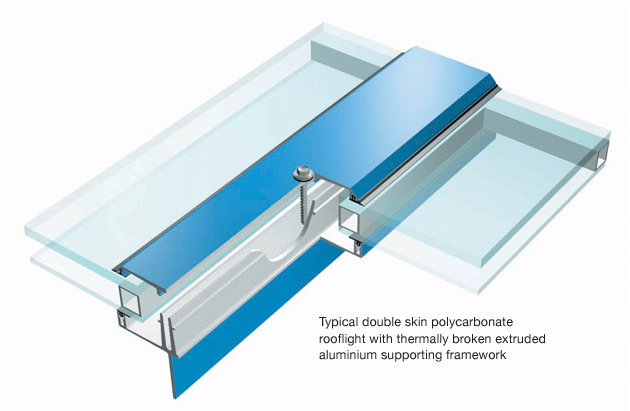 Modern thermoplastics like Polycarbonate, have been developed to provide excellent performance in rooflighting applications. Polycarbonate rooflights provide extremely high impact resistance, making them a popular choice for all kinds of applications, including areas where there may be a risk of damage. Polycarbonate sheet can be cold bent or thermoformed, making it suitable for designs with curved glazing, including the highly popular continuous barrel vault format used on so many commercial, retail and leisure applications. The UV protected surfaces of modern polycarbonate resist weathering to extend the life of the sheet, although longevity cannot compete with glass. Polycarbonate is available in solid sheets and structured multi-wall sheets designed to provide increased thermal insulation. Multi-wall sheets can also be filled with Lumira® aerogel, to further enhance thermal insulation. Polycarbonate glazing is relatively light, allowing designs with reduced emphasis on supporting structures.tructural glazing.